This mother’s day ecard starts off with a close up shot of a mother smiling at the camera. Text appears saying "A proper mum like you can move mountains". The scene then changes to the mother, standing behind the father, who is in a chair watching TV and drinking a beer. Text appears saying "especially when they are stuck to the sofa." The mother then grabs the back of the chair and shoves it so hard that the farther flies out of the chair through the window and onto the lawn mower in the garden. You then see the mother sitting in the chair herself watching a bit of TV. Happy mother’s day appears above her. 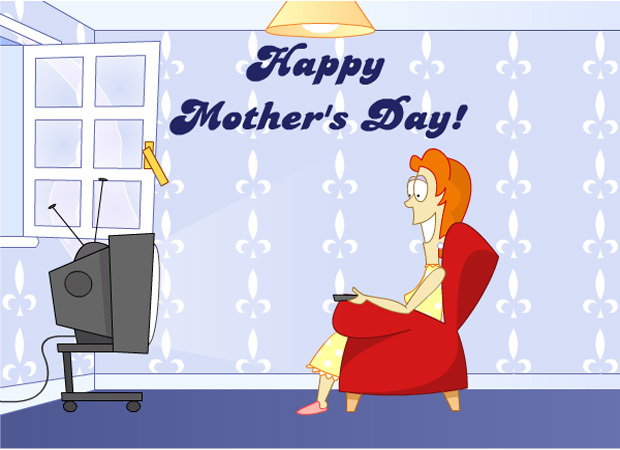 This mother’s day e-card is great and is very popular.